The historic victory of the Narendra Modi-led National Democratic Alliance (NDA) in May had fuelled the hopes of the common man, corporate leaders, investors and policy wonks alike. Finance Minister (FM) Arun Jaitley's budget covered a lot of ground but there was no major announcement. 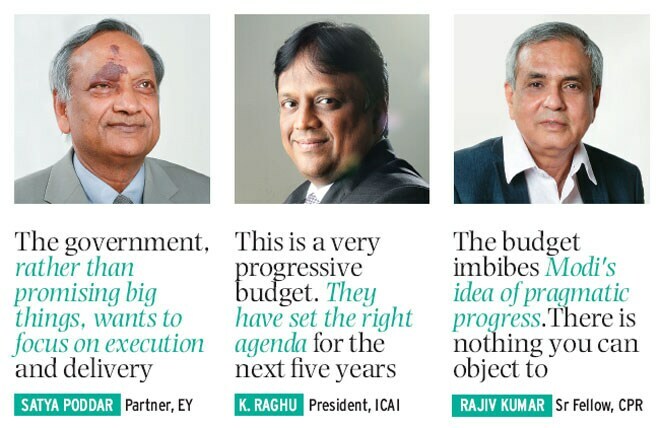 Business Today tried to decode the budget with a panel of experts comprising Ajit Ranade, Chief Economist, Aditya Birla Group; Satya Poddar, Partner, EY; Rajeev Gowda, MP, Rajya Sabha; Rajiv Kumar, Senior Fellow, Centre for Policy Research; K. Raghu, President, Institute of Chartered Accountants of India (ICAI); Sudheendra Kulkarni, Chairman, Observer Research Foundation (ORF), Mumbai. Ajit Ranade: The budget was expected to signal three things: an anti-inflationary stand, steps towards fiscal consolidation and growth impetus. I think it has delivered on all three counts. So this budget is hopefully the first step in a longer journey. The fact that no new taxes have been announced is an anti-inflationary measure and a big relief for taxpayers. The FM chose to keep the target fiscal deficit at 4.1 per cent, which incidentally is also a non-inflationary stand towards fiscal policy. On the growth impetus, the variety of measures, especially on infrastructure, are pro-growth. It was surprising that he actually chose to stick to the 4.1 per cent fiscal deficit target. When this same number was presented in February as part of the interim budget by the UPA government, the Opposition then had termed it unreasonably rosy and unrealistic. Satya Poddar: I did not expect any bold reforms from the government, which is just 45 days old in office. I had wished that the government simply stays away from any controversial structural reforms. It seems the government, rather than promising big things, wants to focus on execution, proper design and delivery. Sudheendra Kulkarni: What was expected of the FM was a certain vision - a roadmap for India's economic growth and social development for the next five years. He said that economic growth would be revived to 7 per cent to 8 per cent over the next three to four years. But how he is going to attain it has not been spelt out. We, of course, did not expect him to work out all the details in 45 days. But this government was a government in waiting. They ought to have worked out their vision to transform India, spur growth with sabka vikas (development for all). K. Raghu: This is a progressive budget. They have set the right agenda for the next five years. Global corporates are looking to invest in India. They wanted some assurance that we will have a stable tax regime because concepts like 'tax terrorism' were never heard of in Indian history. The government has assured that retrospective amendments should not be made in tax laws. Rajeev Gowda: The BJP came to power riding on the politics of hope. What they have delivered in their few days in office is the politics of deception. They have ignored the fact that the last decade has witnessed the highest growth that India has ever seen. They have tried to come up with a new name for an existing programme. This is essentially a budget with not much imagination. If at all there is, then it is in the form of Rs 100 crore here and Rs 100 crore there, which is like neither here nor there. There were a lot of things which we were prevented from doing in the last decade. For example, FDI in retail. When we tried to push it we were forced to compromise and leave it to the states. There were attempts to cripple every law we tried to pass. 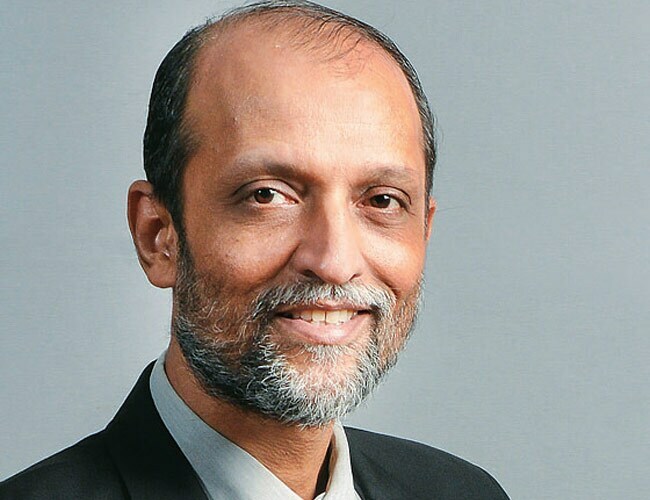 Ajit Ranade: This was the chance for the FM to put a more realistic fiscal deficit target. But he chose to stick to 4. 1 per cent. The theme of this number revolves around non-tax revenues. The target is Rs 63,000 crore or Rs 64,000 crore, the highest ever. The target achieved in the last 10 years has been only Rs 38,000 crore. K. Raghu: The government has only two income sources. One is revenue from tax. Today the focus of the government is on raising money through taxes. Service tax revenue has gone up compared to the earlier years. The second option is disinvestment and FDI. The government tries to balance between the two options. I think there is a lot of domestic savings in India and this not being tapped. Speak to any investor and he/she would be reluctant to put his money in any company. Earlier investing in shares of a limited company was popular. We need to bring back that equity culture. Government has taken a step forward by introducing Kisan Vikas Patra and National Savings Certificate. They have also come up with an instrument for higher education of the girl child and increased the Public Provident Fund limits. Rajiv Kumar: I wish he had not adopted that fiscal deficit target. But now that he has a target, he has taken it as a challenge. But there are a couple of things. One is the tax revenue locked-up in litigation. The FM has to monetise hoards of gold. It can be used as a Cash Reserve Ratio substitute and they can offer imaginative products like Turkey and South Africa has done. This will bring non-financial savings into financial savings and improve the fiscal position. Rajiv Kumar: I dont think anything in this government will happen without a Modi stamp. He is that kind of a leader. This one does have a Modi stamp. All that he has mentioned in his speeches does find a mention in the budget be it bullet trains, smart cities, sagar mala or the linking of the rivers. More importantly, the budget also imbibes the Modi idea of pragmatic progress. This is what he has done in Gujarat. There is nothing you can really object in the budget. All you can say is it is not ambitious enough. But that is always subjective. In an objective term, like I had objected to Chidambaram's budget of 2008 when he let the public expenditure splurge by 3.8 per cent of GDP in one go, there is nothing like that in this budget. Given the circumstances, let us give them the benefit of doubt. Rajeev Gowda: There is a clear Modi imprint on this budget. Rs 200 crore for a Sardar Patel statue, all for symbolic value a case of totally misguided priorities. It is not a question of are we being charitable here. It is about how uncharitable we have been to the previous government. Look at 2008, you had a recession. We are connected to global markets. We put in place the measures that made things come up again. The economic survey says that we are doing much better. The current account deficit is under control and the economy is in good shape. Satya Poddar: I suspect that a lot more is going to be done on the subsidy front. But the FM did not want to create a street demonstration by announcing in advance. 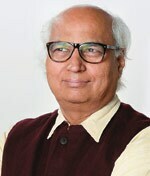 Sudheendra Kulkarni: The FM has talked about constituting an Expenditure Management Commission. It is a good thing. But well-targeted subsidies are not a new idea. Several Congress finance ministers have also said this. There is an urgent need for the Congress and the BJP to come together and have a dialogue on the burden of subsidies. 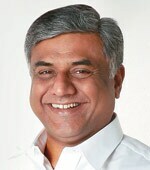 Rajiv Kumar: Please note that he (Jaitley) has not touched the diesel and petrol price hike. So, there will be a reduction in petrol subsidy in-built into this budget... You will see a restructuring of Food Corporation of India very soon to improve efficiency. Rajeev Gowda: I can only hope that there is a good monsoon, the crisis in Iraq does not worsen oil prices and there is enough space for the government to manage the economy in a manner that we all want.